What unites Trump and RFK Jr. is a scary denial that they’re anti-vaxxers. They present their skepticism of established science as reasonable. And that makes their views even scarier. Donald Trump and Robert F. Kennedy Jr.
Photo illustration by Slate. Photos by Drew Angerer/Getty Images, Spencer Platt/Getty Images. This post has been updated with new information since it was originally published. President-elect Donald Trump met with Robert F. Kennedy Jr. on Tuesday morning, a sit-down that might at first seem odd: One, after all, is a Democratic scion and environmental lawyer, while the other is about to be the world’s only climate change–denying head of state. 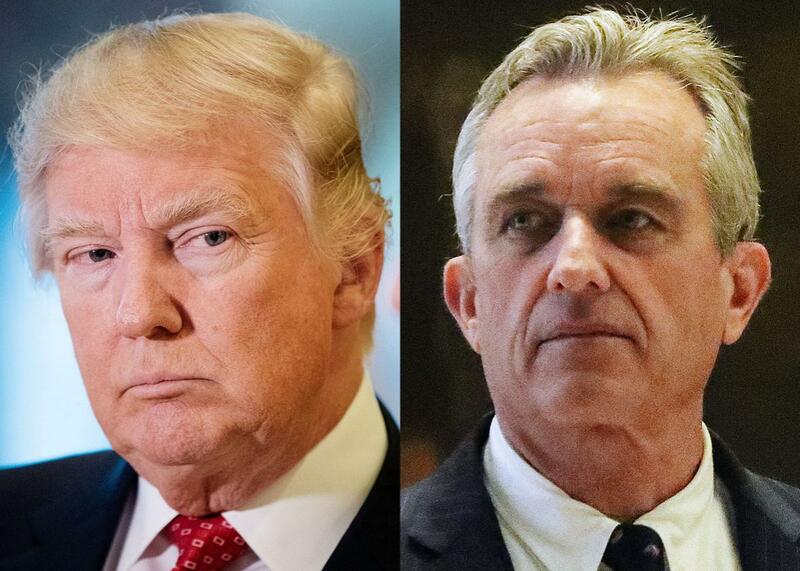 As recently as August 2016, RFK Jr. referred to Trump as “dangerous” and “a demagogue,” but now they’re conspiring over common ground: They both refuse to accept the science on vaccination. Apparently it went swimmingly. Soon after the meeting, Reuters correspondent Ginger Gibson tweeted that RFK Jr. said Trump “asked him to chair a commission on vaccine safety and he agreed.” (According to pool reports, Kennedy said “He asked me to chair a commission on vaccine safety and scientific integrity.”) Trump’s team later said that while the PEOTUS “enjoyed the discussion,” no formal offer had been made, stating “The President-elect is exploring the possibility of forming a committee on Autism, which affects so many families; however no decisions have been made at this time.” More alarming than the fact that these statements contradict each other is the fact that in referencing the same potential committee, Kennedy describes it as a “vaccine safety committee,” while Trump’s team calls it a “committee on Autism.” This reinforces the false idea that there is a link between the two. And yet both men also pretend they are not as bad as the “anti-vaxxers” who erroneously think vaccines cause autism. Kennedy and Trump have each made pointed statements about the fact that they vaccinated their own children. They seem to think this should allow them to say whatever else they want about vaccination without receiving the same sort of criticism that anti-vaxxers get. Of course, as prominent public figures the exact opposite should be true: They should be held to a higher standard than confused parents when it comes to vaccination. Instead they both spew dangerous falsehoods—falsehoods that apparently may now make their way into actual policy. [W]e’ve taken him on a very slow process. He gets one shot at a time then we wait a few months and give him another shot, the old-fashioned way. But today they pump the children with so much at a very young age. We do it on a very, very conservative level. Delaying vaccination introduces a lot of unnecessary risk. This is one of the primary factors guiding the current vaccine schedule, Salmon explains. We give vaccines to children when they most need them. Delaying vaccination is not conservative—it’s ignoring the evidence. But this is classic Trumpism: His refusal to accept the expertise of others while describing his own sense as common-sense allows him to make completely incorrect claims and deny that there’s anything wrong with them. While campaigning, Trump even met with disgraced scientist Andrew Wakefield, whose discredited work helped birth the anti-vax movement, at a donor event. This mistrust of expertise fits right in with RFK Jr.’s vaccination theories, which are built around the blatantly false idea that vaccines are unsafe, and the more paranoid idea that there is a conspiracy to cover this up extends from the Centers for Disease Control and Prevention to elected officials to journalists. My Slate predecessor Laura Helmuth got a full rundown of RFK Jr.’s vaccine theory when he called her to complain about our coverage of his views in 2013, which Slate referred to as “anti-vax,” a label that Kennedy rejected, saying he was “very much pro-vaccine.” Kennedy wrote a book that attempts to connect a component of vaccines to neurodevelopment disorders including autism, called Thimerosal: Let the Science Speak, and regularly attempts to meet with elected officials regarding his concerns. In Helmuth’s piece, journalist Seth Mnookin succinctly describes Kennedy’s problematic assessment of the CDC: “What he has done is taken concern that there could be a problem as evidence that there was a problem.” This, coincidentally, is why putting Kennedy in charge of a commission on vaccine safety would be so frightening. Kennedy has already shown himself to be willing to sacrifice much of his political clout over beliefs that, when examined by experts in the field, do not stand up to scrutiny. Apparently it was worth it: His previously unpalatable opinions might be elevated by the most powerful man in the world.